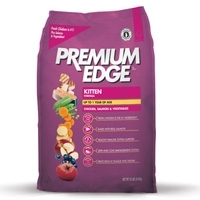 Diamond Premium Edge Kitten 18 Lb. Premium Edge Kitten Chicken, Salmon & Vegetable Formula contains high levels of chicken and fish protein for optimal growth and development. Also contains balanced Fatty acids for optimum health. Ideal for kittens and pregnant or nursing queens. Diamond Premium Edge Hairball Senior Cat 18 Lb. 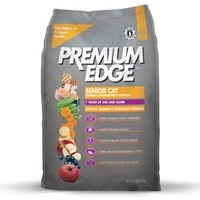 Premium Edge Senior Cat Chicken, Salmon & Vegetables Hairball Management Formula is specially formulated for older cats. Contains lower fat to help maintain body weight, added glucosamine and chondroitin to help maintain healthy joints, controlled ash and magnesium for a healthy urinary tract, and a natural fiber blend to help control hairballs.